Background on several projects that the HWF is involved with on the Harrison River – the site of the world’s largest gathering of bald eagles & Canada’s most productive salmon river. Some background on three cooperative conservation projects of the Harrison – Chehalis River Complex that we and many other NGOs have worked tirelessly to create. The objectives are to protect the water, the salmon and the eagles of this incredible waterway. 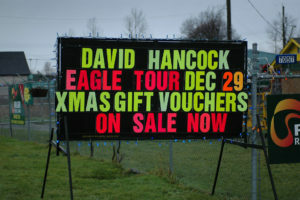 David Hancock sits on the administration boards of two of the key conservation organizations of the Harrison – Chehalis River System – the Fraser Valley Bald Eagle Festival FVBEF, the Harrison Salmon Stronghold HSS. 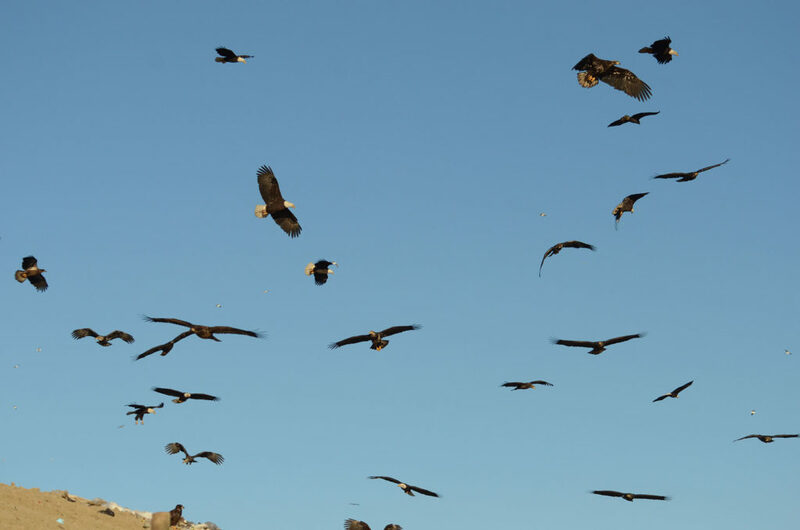 These organizations and the Hancock Wildlife Foundation work equally closely with the Sts’ailes First Nations SFN – who have resided at this precise site for over 10,000 years – on a number of other conservation projects. What the HWF does with the Harrison Salmon Stronghold! David Hancock has been a Founding Member and Director of the Harrison Salmon Stronghold since its inception in 2012. In essence the Harrison River is Canada’s most important salmon river and by default hosts the largest single annual gathering of bald eagles in the world. If you are new to eagles please see our: Meet the Eagles at the Harrison page. When the Hancock Wildlife Foundation proposed the Chehalis Flats Bald Eagle & Salmon Reserve it was initially to the FVBEF, the Harrison Salmon Stronghold and the Sts’ailes First Nations and we received their full support, and then the other NGO’s in the region immediately jumped on board. This was soon followed by the Provincial Government Wildlife Authorities, initially saying “we couldn’t declare this area a Reserve” — citizens could not do that — to be followed a few months later with a “thank you” call to say that now that the community has rallied around a “Reserve” concept, they the British Columbia Department of Environment would work to make the area a protected “Wildlife Management Area” WMA — something they had tried to do twice before and failed — BUT which has now been done!! Community effort can get recognized — and get results. This now official WMA still needs constant monitoring by all concerned NGOs in order to insure the government does the right thing. We are watching! It was the HSS with the Sts’ailes Band lead that followed up on our “Chehalis Flats Bald Eagle & Salmon Reserve” to make this area a Preserve. See the Official web site: Lhá:lt/Harrison-Chehalis Wildlife Management Area. The HWF now plans to develop some methods of assessing the conservation impact of the WMA. We are seeking some possible cooperative study with a local university to incorporate this project into continual working study. This project is awesome! – perhaps breaking down for me how kid’s natural responses can break down the ‘steel and stalwartness” of grown men. The essence is that kids get to catch out of the river, to handle and to tag 50 pound salmon! But the kids are often only 50 pounds or less! And their guides are the burley native fisherman who normally do the netting and tagging. Seeing busloads of kids descend to the shores of the Chehalis – Harrison River, get into hip waders, sometime only revealing eyeballs and some hair protruding abpve the waders – and get ushered around by huge native fisherman and volunteers as they grapple with thrashing 15 to 50 pound salmon, goes from frightful to incredible in seconds. The HWF has purchased an increasing number of dozens of pairs of Waders to facilitate this wondrous learning experience. David Hancock is also annually a presenter to the school children — guess what — talking about the relationship of the river, the salmon and why this place houses the largest concentration of eagles ever witnessed. Each year more schools want to participate. Next year the HSS is also attempting to produce an historical play, presented by the different schools, and centred on the life of the Harrison. The public is welcome to attend at this Harrison Salmon Festival weekday event – though we restrict water access and grappling with the salmon to kids under 14! Yes we have put an age on this despite political correctness. Last year we had a 60+ year old claim he was a student! Also see our HWF Events Calendar for updates — you can during season see these salmon on our underwater CAMS. The HWF has a special place to send donations to our support of this project – the Harrison Kids & Salmon Project This project also needs a sponsor to fund (a) more buses of school kids ($1000.00 per bus load for the bus, attending the play and getting a lunch.) and (b) a professional film producer to make us a video (Cost about $5000.00). Eagle Counts & Eagle Viewers: the Harrison experience! Chack Chack – Can come to Your Door! 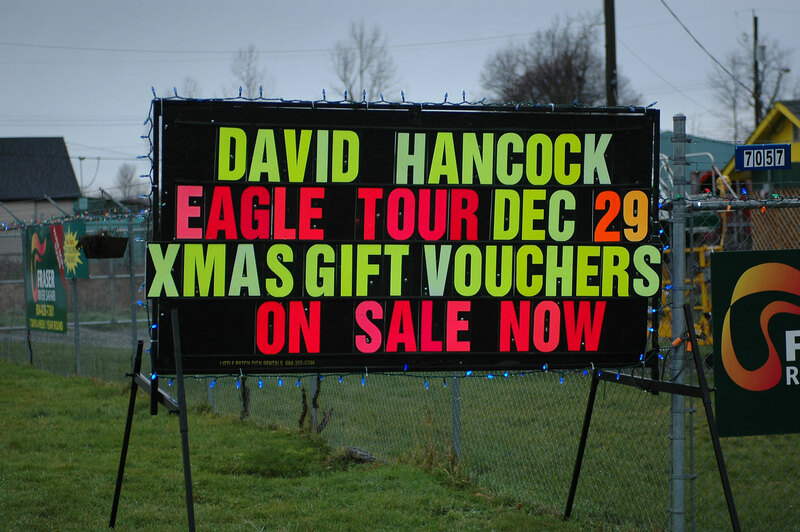 David Hancock will talk about eagles anywhere! As you might guess, Chack Chack is the Coast Salish name for Bald Eagle – if you have listened to them call you know why! This note is to announce that David Hancock will give presentations to groups, adults or schools almost anywhere! The travel costs for national or international speaking engagements are required. One hundred percent of the funds go to the HWF. David will give formal presentations and supplement these with ‘show and tell’ at schools. Do you have a social club needing a vibrant speaker?